#Microsoft365 – Feeling overwhelmed with all the updates in Office 365? Remember the days when you got a new version of Office every 3 years once the ‘investment’ was bled dry? 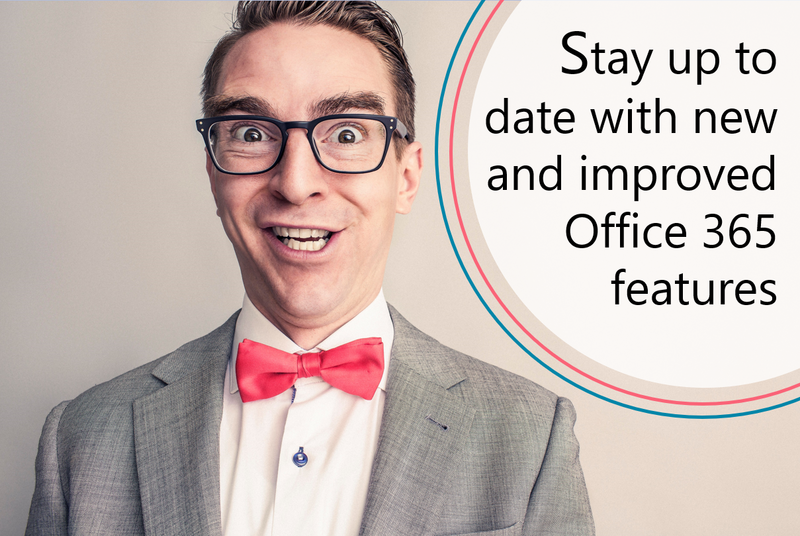 Well the advantage of Office 365 is of course the new stuff ‘daily’, but it is important to stay on top of things – here’s a couple of tips & resources. If I didn’t keep my eye on things – I would miss important updates AND miss out on new cool stuff when they’re released. If you’re in an administrator / trainer role this is even more important. Changes need to be communicated to users in a useful way – to add value – not to confuse. The Weekly digest: Office 365 changes sent by mail really helps a lot as I can scan through the list and pay attention to what’s important. See this blog on how to “Edit Message Center Preferences” to set this up. This blog gives an overview of latest updates and if you scroll to the bottom, you’ll see all the previous months too. Collaborative editing – Excel Work with others at the same time in your workbook. We save for you! – Excel / PowerPoint Changes are automatically saved for documents, workbooks, and presentations stored in the cloud, and you can see others’ updates in seconds. Designer transforms more types of slides – PowerPoint Designer now recommends design ideas for timelines presented as bulleted lists. See what’s changed – PowerPoint Slides that have been modified by other users are highlighted. While you were away – PowerPoint Changes made by others to your worksheets or presentations since your last visit are highlighted. Edit using Learning Tools – Word Learning Tools are now available in Web Layout view. Adjust text spacing and show syllables while you edit. In any view, see each word highlighted as the document is read aloud. Helpful sounds improve accessibility – Word, Excel, PowerPoint, Outlook Turn on audio cues to guide you as you work. Find the command in Options > Ease of Access. No add-in needed. Math equations – Word You can now create and edit math equations using LaTeX syntax. Cloud attachments just got better – Outlook Now, when you save or drag and drop OneDrive attachments to your computer, we download the file for you. Editing a new item is more accessible – Access Use a quick shortcut (Ctrl+E) to edit a new item from a Combo Box or List Box. Label Name property – Access Enhance accessibility by associating a label with a control on a form. I created a Microsoft Team for Office 365 knowledge sharing. There’s a channel for each product. In these channels we’ll post latest updates / blogs etc. – which means you can ‘unfollow’ a channel for a product you don’t deal with etc. This also becomes the feedback mechanism from your team on how the new updates work etc. – before rolling it out to the majority. Make sure that your evangelists and trainers in the various business units / departments are members of this team as well – as they will eventually be the carriers of the ‘good news’.